All schools have a statutory duty to teach Religious Education, which is equal in importance to other National Curriculum subjects. We devote 5% of curriculum time to this subject, which is about an hour a week over the year. This is in addition to the time allocated to Collective Worship. Religious Education is taught using the Kent Agreed Syllabus (2017). Children learn about other religions and world views, fostering respect for them. The Understanding Christianity scheme provides the units for children to learn about Christianity and Rochester diocese provides units which cover Hinduism, Islam, Judaism and Sikhism. Children cover areas such as belief, holy books, pilgrimage, prayer and festivals. We promote the belief that all children are equal whatever their religious background and children who have a particular faith or none have the opportunity to share this as part of their RE lessons. Religious Education is compulsory for all children, including those in the reception class who are less than five years old. Parents have the right to withdraw their child from religious education classes if they so wish, however, in view of the Christian ethos and distinctive Christian character of our school, we would hope that all children admitted will participate fully in RE. Anyone wishing to withdraw their child from RE lessons should discuss this with the headteacher before making a final decision. Here is a link to the Rochester Diocese Board of Education should you wish to view any further information. 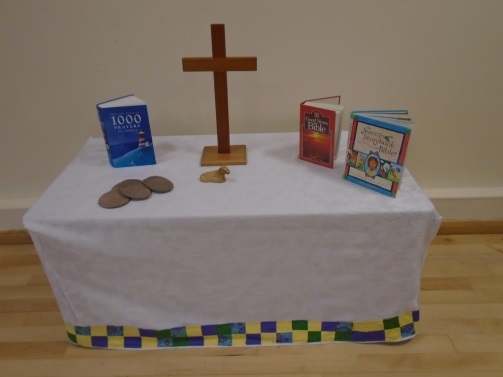 Acts of Worship which are Christian in content take place each day and are an important part of school life. Children focus on topics which are relevant to them such as being a good friend and showing responsibility. These concepts are linked to familiar situations and to Bible stories and Christian festivals. Acts of Worship start by sharing the peace and also include singing, prayer and reflection. Children have the opportunity to participate in leading aspects of worship and parents are invited to join us when their child’s class leads ACW. Once a week, representatives from St Matthew’s church come into school to lead our worship and we visit St Matthew’s church to celebrate festivals such as Christmas and Easter. Parents do have the right to withdraw their child/ren from participating in Acts of Worship after consultation with the Headteacher and an alternative activity will then be agreed.